Happy Thursday evening Friends! Today I'm sharing a recap of 2017's First Friday Home Tours. 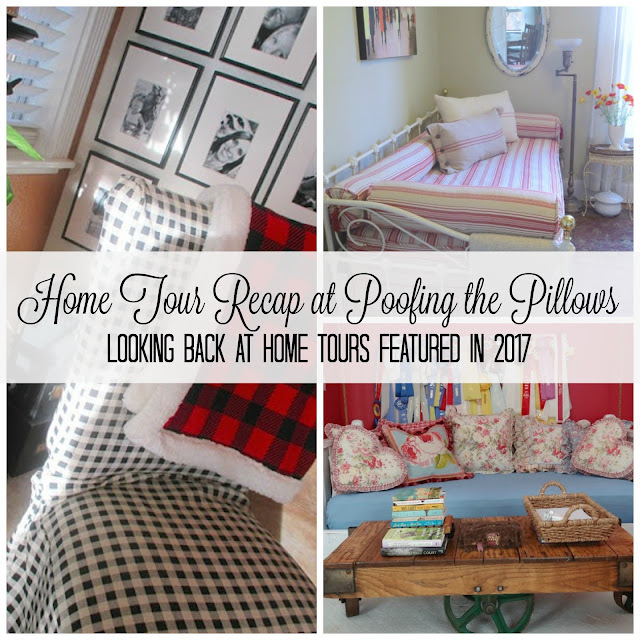 We started January 2017 this way too and you can see that post which was titled, I Know You Love Home Tours! I want to thank you all for reading these monthly posts and leaving such kind comments for the ladies who share with us. If I could load you all in a red Cadillac and take you on home tours I would but since we can't do that....this is the next best thing. So let's go! BJ at Sweet Nothings kicked us off in February with her Summer Cottage. BJ has a long standing love of black and white checks but she mixes in red and other fun colors. BJ cooks the most amazing food, surrounds herself with her wonderful family, and carries on in spite of the loss of her husband, Mr. Sweet. I can't wait to see what she will do in the coming year. 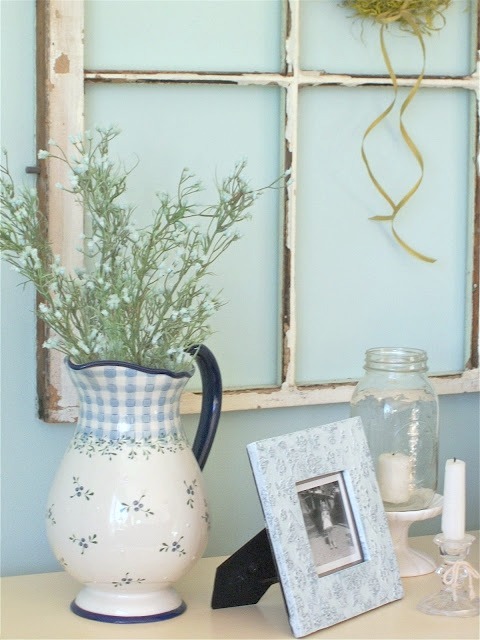 In March we enjoyed JoAnne's home at A Pocketful of Blue. 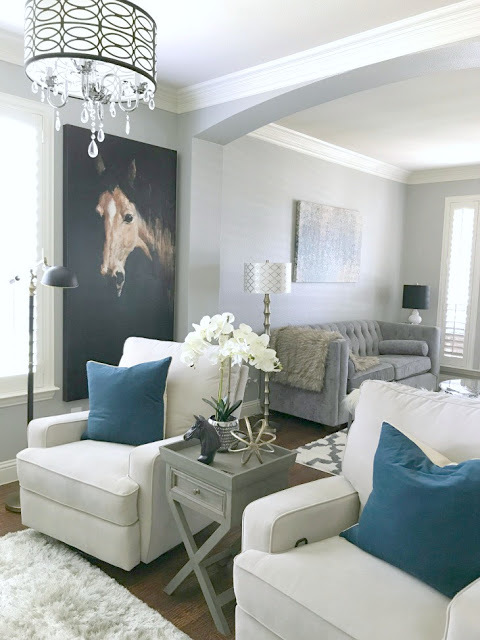 I just love the soft blues and whites that JoAnne uses in her home. Her decorating style is clean but definitely cottagey. 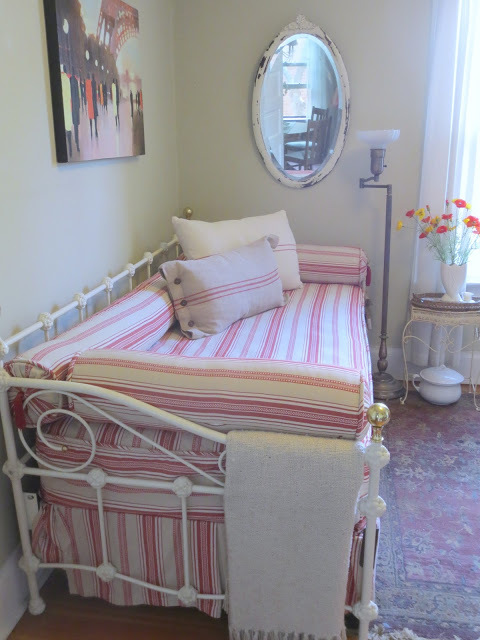 Pat's home at French Country Style From the Foot of the Rockies was the feature for May. Pat is a collector, alley cat treasure finder, and gardener extraordinaire! 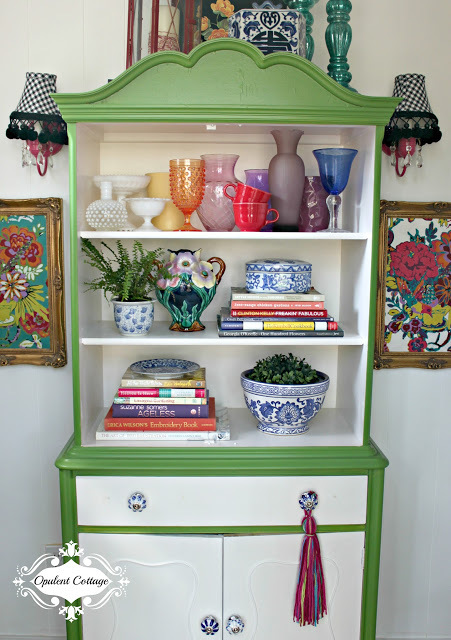 When you visit Pat's blog you'll be inspired by found items that she repurposes or displays in beautiful ways. 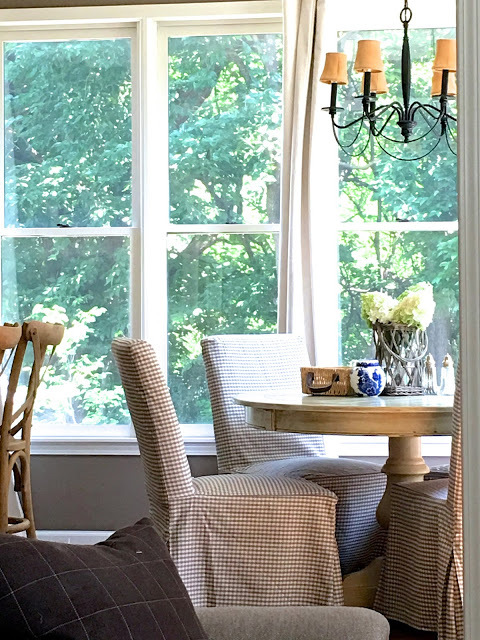 We got a little dose of Fixer Upper style when we visited Jill at Just Plain Jilly in June. Jill is a girl with more talent in her little finger than I have all over! Y'all loved her house and pinned the images many times. Color was the name of the game in July when we visited The Opulent Cottage owned by my friend Andrea. 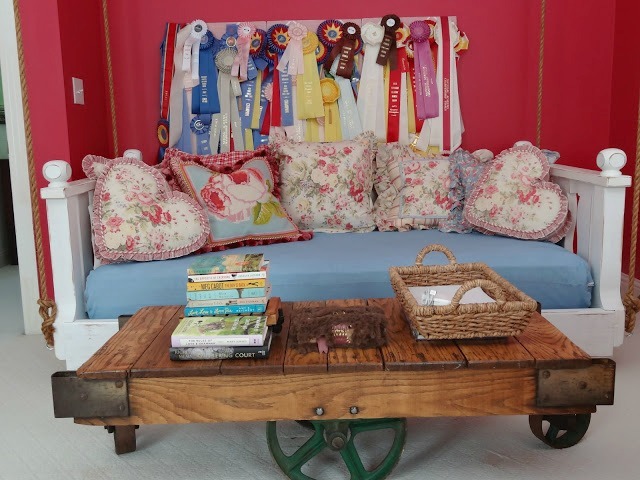 This girl is just as vivacious as the colors she uses in her historic home! Andrea has the able to find the best things at Ross and thrift stores. She can sew, make jewelry, paint walls, well..you name it....she can do it. Definitely visit her to see her recent Christmas posts and her One Room Challenge posts. Alison Lumbatis is a fashion blogger that I follow and her home was the feature for August. Alison's style is a little more modern than the homes I usually gravitate towards but she has created a colorful, beautiful that makes you feel very welcomed. If you need fashion inspiration, definitely visit Alison's website where she shares fun and affordable fashion for real people. September brought us to Ricki Jill's home at The Sketchy Reader. RJ's love of color is clear from the very first glance. I'll be honest...I've studied her photos for hours because I love her style so much. Ricki Jill blogs about books and art. Be sure and visit her as you are building your reading list for 2018. Southern Living should be tracking down my friend Tammy at Hey Fitzy, who was the feature for October. Tammy and her family just moved into their new home this past year and it's gorgeous! Tammy shares delicious food ideas, organizing, and other ideas for life while raising five kids with her college sweetheart. Michele's home, The Nest at Finch Rest was the feature for November. Michele decorates with earth tones that are muted and cozy. She plays the grand piano, gardens, and has a love of tea. Just looking at her blog brings a feeling of peace to my soul. And last but not least, in December we saw Julie's home at Creating This Life. Julie's another one of those ladies I wish I could follow around to estate sales and thrift shops. She sees the beauty in things that need love and transforms them for her home. I've almost filled the home tour calendar for 2018 and can't wait to bring you more wonderful homes! Thank you so much for following along. You featured so many lovely, inspiring homes this past year Stacey. Looking forward to those you feature this year. Hi Stacey! This series is one of my favorites in blogland. I always find a new blogger to follow! Hope you have a wonderful weekend. I'm sure that it will be a lot warmer than mine! Stacey, what a lovely recap of all the beautiful homes you have shared! I love this monthly feature! Yes, I so love the beautiful home tours!!!! Looking forward to the ones in 2018. Happy New Year! Ooh, Stacey, I loved seeing this recap of all these tours all in one post! I'll be going back over a few of these and lingering. Good series! This is a great recap post Stacey. I love going back through these beautiful homes. You really did a great job finding everyone's taste in decor with all of these homes. I am grabbing a nice beverage this morning and going back through all of these. 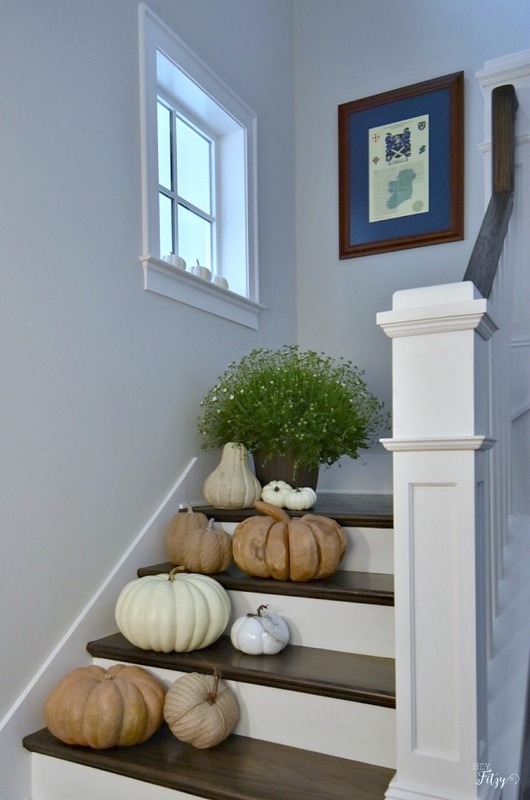 Love the review -- especially the pumpkins on the stair steps! It's times like this I wish I lived in a two-story house! I do love home tours! I looked forward to this each month. I'm glad you are continuing it, Stacey! All wonderful tours! I have enjoyed each one. Oh, my, this was almost too much beauty for one post! Love them all and look forward to this year's. Blessings! Such a great recap! You have featured some gorgeous homes this year and I look forward to more in 2018! I love that you featured all different styles of décor in your posts throughout the year. Looking forward to this years picks. I love tours and all the ideas you can pin and try, thanks. Great home tours, Stacey. Wonderful inspiration. Thanks for sharing again. Beautiful! I always looked forward to these posts. You have a great eye and I found some awesome new to me blogs! Thanks! 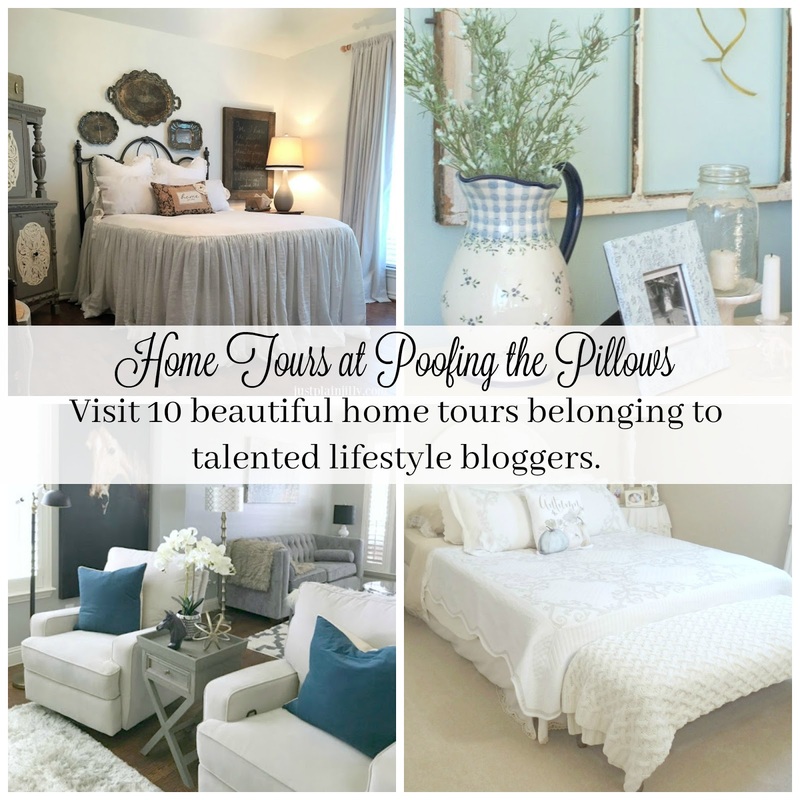 So many beautiful home tours! Can't wait to see more! 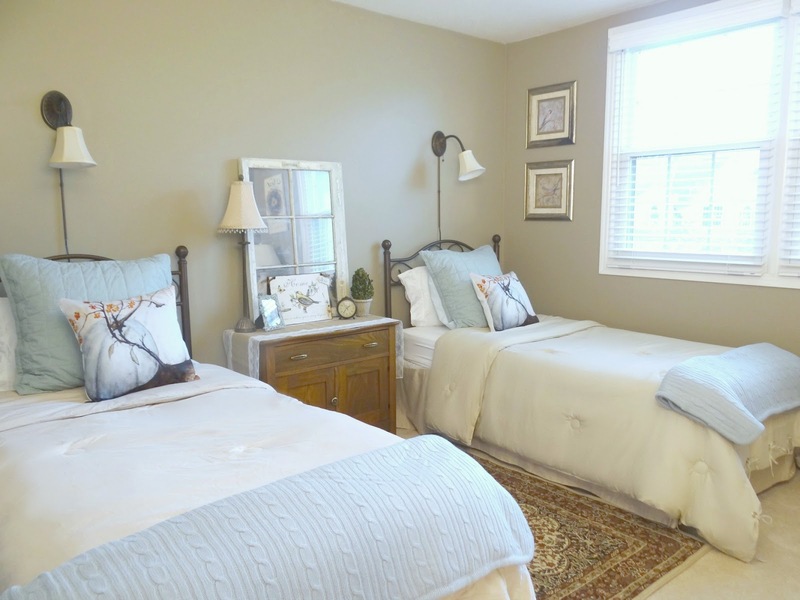 Your FEATURED HOME TOURS are one of the most fun things going on in Blogland. Thanks so so much...looking forward to all the ones you have planned for 2018. I loved being one of your home tours this past year, Stacey. Thank you so much for including my home. I can’t believe it was almost a year ago! It looks like I missed a couple of your tours so I will definitely be checking those out too!! Wonderful features and new blogging friends! 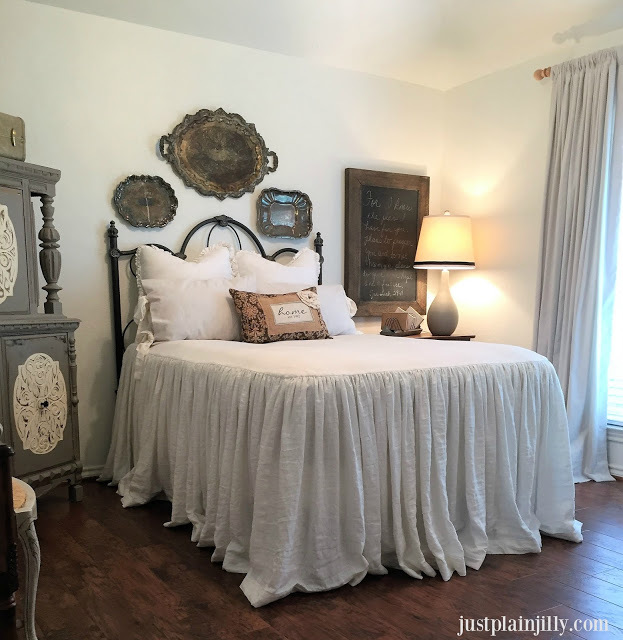 I can't thank you enough, Stacey, for including me in your home tour and all the help you given this beginning blogger. I'm proud to know you! A great tour of homes. I can't wait to see what 2018 will bring! Thanks for sharing with Keep In Touch! You have a beautiful house.. you gave so much inspirations.. thank you.. Finally getting caught up on some of your posts :) Thank you so much for such a sweet compliment!! Hoping to see you sometime soon! xoxo!